If you haven’t made a weekend trip upstate yet this summer, well, what are you waiting for? Whether you're looking for a getaway along the pristine lakes in the Adirondacks, a grander stay in a castle located high up in the Catskills, or a quiet refuge in the woods after sampling some of the greatest wines in the world, upstate New York has you covered. That goes for lodging, too -- skip the drive back to the city, make a real weekend out of it, and enjoy some of the best hotels, inns, and B&Bs the state has to offer. 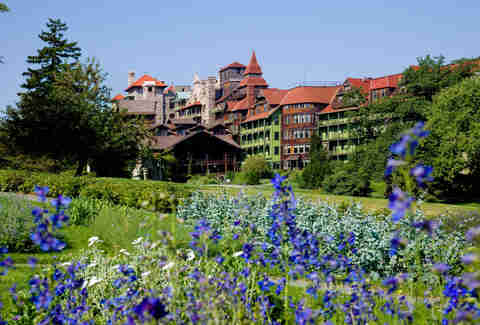 Located on a private island situated on Lake George in the Adirondacks, this enormous resort features a 137-room Victorian-era hotel that’s listed in the National Register of Historic Places, plus condominiums and, last but not least, a 2,000sqft castle (which yes, you can also stay in). In addition to lodging, The Sagamore also has its own 18-hole golf course, a luxury spa, and several dining options, including a steakhouse and a pool bar, where guests can dine poolside while taking in panoramic views of the lake and the mountains. What's nearby: While it’s tempting to simply stay put on The Sagamore’s private island, hop on board The Morgan, the resort’s 19th century-era touring boat to explore Lake George. After touring the waters, head to Adirondack Park for prime hiking trails and mountain views. This 28-room luxury hotel was designated a National Historic Landmark in 1986, thanks largely to it playing a major role in the Arts and Crafts Movement, a style of decorative art and furniture design, in North America. Elbert Hubbard, an American writer, artist, and philosopher, founded the Roycroft and used its campus to establish a community of artists who worked and created Arts and Crafts furniture and art. 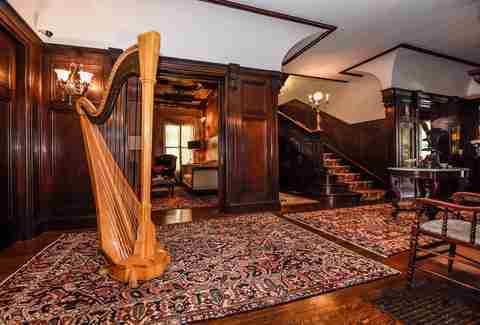 At present, guests can enjoy luxury rooms furnished and decorated with Arts and Crafts stylings, fine dining at the Roycroft’s restaurant, walking tours of the campus, and workshops and demonstrations. What’s nearby: Take a walk through East Aurora’s village to get a sample of old-time America. Spend some time along Main St, which is filled with cafes, restaurants, and locally owned shops, including Vidler’s 5 & 10, a beloved store that sells classic games, toys, gifts, and old-fashioned candy. Then head over to the Aurora Theatre to catch a movie in a theater that was built in the 1920s. If you’re more keen to enjoy the outdoors, take a quick drive to Knox Farm State Park and wander around the nature trails. Originally a farmhouse built in the Civil War era, this bed & breakfast puts an emphasis on eco-friendly and sustainable living. 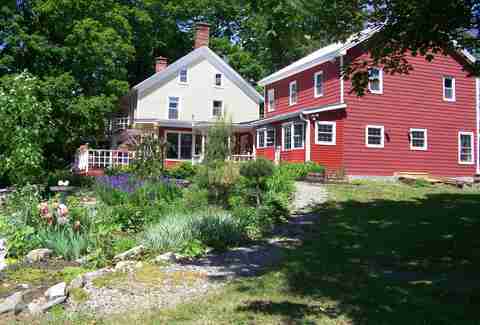 The B&B’s owners, who also happen to be classically trained chefs, serve delicious home-cooked breakfasts using locally sourced ingredients, some of which are grown right at the farm. The farm’s 10-acre property has been listed as a wildlife sanctuary, making it a prime spot for birdwatching and catching glimpses of foxes, bobcats, and monarch butterflies fluttering in the colorful gardens. The best time to stay is in the fall, when the farm’s lush green hills change to different shades of orange and red. What's nearby: A visit to Saratoga Springs would be nothing without heading to the Saratoga Race Course to see thoroughbred horseracing, or to the polo grounds to catch a polo match. After your equestrian fix, head to Downtown Saratoga, which is filled with shops and galleries, spas, fine dining, and ample nightlife. 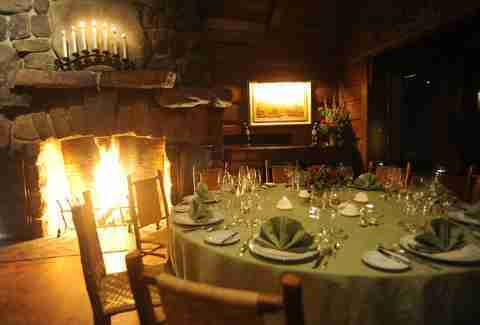 Though The Point is located in the secluded beauty of Adirondack Park, guests will hardly be roughing it in the wilderness at the extravagant resort, which was originally built and used as a retreat by William Avery Rockefeller. 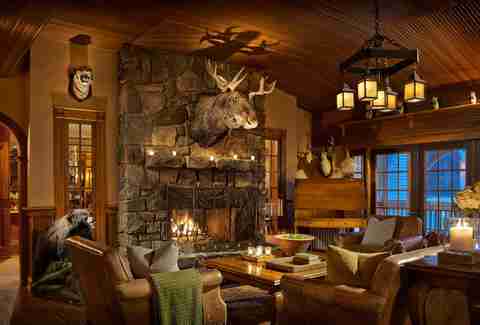 The resort’s log buildings are equipped with 11 guestrooms, each with its own stone fireplace, lake views, and rustic furnishings to complete your mountain getaway. Black-tie dinners are served in the Great Hall and are thoughtfully planned weeks in advance by the resort’s executive chef, in accordance to each guest’s dietary needs. A pub, a terrace, barbecues, and an outdoor bar are also available on the 75-acre property. This kind of high living is only available for adults, as the resort has an 18-years-old-and-up policy -- however, pets are lovingly welcomed. What's nearby: In the summer, guests can hike up the mountains or the nature trails in the woods, or go boating on Saranac Lake. Winter is also a popular time to visit, when the lake freezes over and becomes a prime spot for ice fishing and ice skating. Cross-country skiing and snowshoeing in the woods is also available. This 154-room Victorian hotel may seem like the main attraction to those visiting Chautauqua, with its antique furnishings, upscale American restaurant, and wrap-around porches for catching a breeze while looking wistfully out toward Lake Chautauqua. 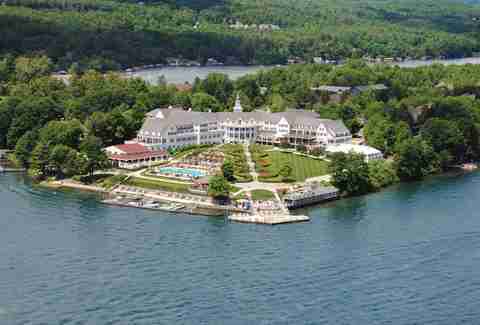 But what actually draws visitors to stay at this hotel isn’t the hotel itself -- it’s the grounds it’s located on; the Chautauqua Institution. 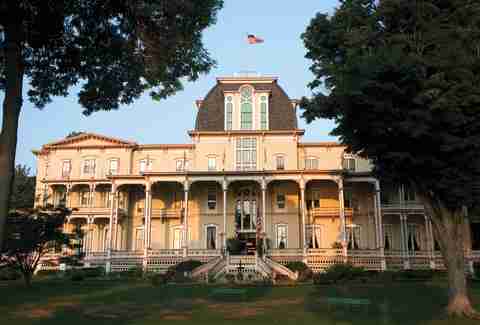 Referred to by President Theodore Roosevelt as “the most American thing in America,” Chautauqua was founded in the 20th century with the intention of educating, enriching, and stimulating the minds of the American population. Today, the Institute still operates under this mission, with a full summer schedule filled with lectures, seminars, and arts performances that include symphonies, opera, theater, and dance. What’s nearby: In addition to the slew of cultural activities and events offered by the Chautauqua Institution, the town of Chautauqua is located on a lake bearing the same name, and is a popular weekend getaway for Western New Yorkers looking to go boating or jet skiing, which are available to rent. Chautauqua also has a sizable population of Amish people, who sell delicious baked goods and furniture in various shops (and sometimes, straight out of their own homes) throughout the town. Mirror Lake Inn is both the place to go when you need to relax, unwind, and recharge while taking in the beauty of the Adirondacks, and a go-to for sports enthusiasts looking to ski nearby. In addition to luxury suites that offer stunning views of the shores of Mirror Lake with mountains as a backdrop, this resort also has a spa on-site that offers day packages as well as full salon services, plus three eateries, including The View, Lake Placid’s only AAA Four Diamond-rated restaurant. What’s nearby: Mostly known for hosting the 1980 Winter Olympics, Lake Placid is a haven for sports lovers, especially skiers; it’s known for being one of the best aprés-ski areas in North America, which means it’s a go-to for nightlife and socializing after spending the day on the slopes. Head to The Cottage for drinks, dinner, or ice skating on the lake if you're still feeling adventurous. If it's summertime, take a hike in the mountains, or simply sit alongside the shores of Mirror Lake and catch a gorgeous sunset before dusk. Overlooking the cascading Middle Falls in Letchworth State Park, this inn is the ideal place to stay if you're not into camping, but still want to enjoy what’s referred to as the “Grand Canyon of the East.” Guest rooms, lodges, and a four-bedroom guesthouse are available to guests, with peak season falling in October, when the park transforms into vibrant colors during fall foliage. After spending the day exploring, dine at Caroline’s, the inn’s on-site restaurant. What’s nearby: Letchworth State Park is the main draw in Castile. It features over 14,000 acres of land, the Genesee River, and a 550ft-deep gorge, which is what has drawn comparisons to the Grand Canyon. Hiking, white-water rafting, kayaking, and horseback riding are just some of the activities available inside the park. 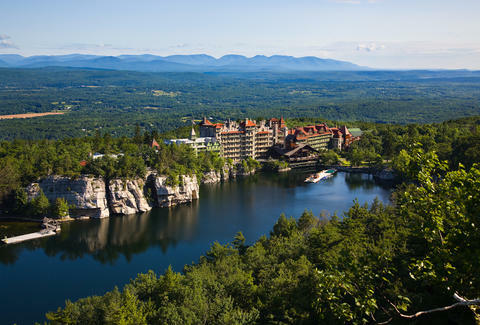 Resembling a castle lair more than a hotel, the impressive Mohonk Mountain House is located just 90 miles from New York City, in the Catskill Mountains in the Hudson Valley. Guest rooms are furnished with Victorian antiques and furniture, with insane views of the mountains and Lake Mohonk (cottages on the premises are also available for a more quaint stay). Guests can enjoy a meal plan that includes breakfast, lunch, dinner, and afternoon tea & cookies to round out the royal feel of this resort. A full-service spa is also located on the property, and there are plenty of options for daytime activities if you’re really looking to experience the outdoors to the fullest. What’s nearby: Hiking trails galore, guided tours and hikes, boating, fly fishing, barbecues, tennis, swimming, golfing, horseback riding, and evening campfires with s’more-making are just a few of the activities guests can expect while staying at Mohonk Mountain House. Housed in a former mansion, this nine-bedroom boutique B&B is the perfect place to stay if you’re looking to explore Buffalo’s nationally recognized Elmwood Village. Heated marble floors, plush beds, home-cooked breakfast, and a very attentive and friendly staff are just some of the amenities this new inn has to offer. It’s also located on one of the most beautiful streets in Buffalo, letting guests view some of the 20th-century mansions built during Buffalo’s heyday (when it was one of the richest cities in the nation, thanks to the success of the Erie Canal). What’s nearby: Located just off Elmwood Avenue, in the heart of Elmwood Village, InnBuffalo is surrounded by lots of locally owned shops and boutiques, cafes, and a park system designed by Frederick Law Olmsted. There are plenty of options for dining, and the various bars, coupled with the proximity to SUNY Buffalo State, make for a lively nightlife scene. Be sure to stop by the Albright-Knox Art Gallery during your stay; it's a world-renowned modern art gallery that features works from the likes of Andy Warhol, Vincent Van Gogh, Jackson Pollock, and Frida Kahlo, to name a few. At this historic B&B located in the heart of Alexandria Bay’s Downtown, guests can enjoy breakfast made from locally sourced ingredients before heading out to explore the Thousand Islands (a collection of over 1,000 small islands, full of mansions, castles, and yacht houses). Since the Captain only houses five bedrooms, guests can expect an easygoing, quiet stay, in addition to a knowledgeable staff that’s happy to help arrange boat tours and other fun activities. What’s nearby: Take a boat tour along the St. Lawrence River to admire all the scenery and learn about the history of New York’s Thousand Islands. After the tour, opt to go fishing, golfing, or just enjoy a fresh seafood dinner. 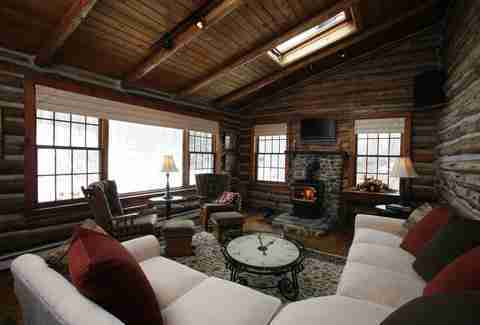 This three-bedroom chalet is nestled in the woods of Canandaigua, right in the Finger Lakes Region, one of the best wine regions in the country. Each room is equipped with gas fireplaces, large soaking baths, and heated towel racks to ensure a comfortable night in year-round. What’s nearby: Take advantage of the Seneca Lake Wine Trail; a collection of wineries and vineyards located around Seneca Lake. Many opt to purchase packages for guided tours, but visitors can also tour the wineries solo and at their own pace. After a wine tasting, go for a steamboat tour along the lake, check out the nature center and racetrack, or, if you’re not feeling especially fearful of heights, opt for a hot air balloon ride. 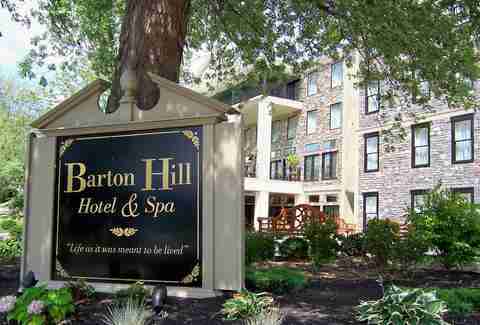 Just minutes away from Niagara Falls, the Barton Hill Hotel & Spa offers guests a luxurious stay in the charming town of Lewiston. The suites here all have their own fireplaces, soaking tubs, and, most importantly, incredible views of the Niagara Gorge. A spa and restaurant are also located on-site. What’s nearby: Hike Niagara Gorge and witness the raging rapids and the whirlpool in the Niagara River before experiencing the main attraction: Niagara Falls. After viewing the falls, head back to Lewiston to take a self-guided audio tour (provided by the hotel) to learn about Lewiston’s role in the War of 1812 and the Underground Railroad. In the summer, you can take advantage of the many festivals held in Lewiston, including the Historic Jazz Festival, and concerts held at Artpark. Caroline King is a writer and an avid traveler who misplaces her room key and forgets her room number more often than she’d like to admit. Follow her on Twitter, or read about her travels on her blog.